All the talk about a second wave of condo development in Brooklyn is finally coming to fruition. On the heels of a rental boom, the newest residential projects to hit the drawing board in the borough are increasingly condos. While some developers may be trying to replicate the success of projects like Toll Brothers’ under-construction Pierhouse at Brooklyn Bridge Park, where condo prices were increased eight times since February and 50 percent of units are already sold, for others, it’s just a matter of basic economics. “The cost of land and construction — land is triple and construction is at least 40 percent more [than it was in 2011] — it’s almost impossible to build rental. It doesn’t pencil out,” said Miki Naftali, chairman and CEO of the Naftali Group, the Manhattan-based firm that entered the Brooklyn market two years ago. “If you look at the new developments right now, those that are on the drawing table or just started construction, most of them are condo developments,” he said of projects in Brooklyn. This month, The Real Deal surveyed the residential development landscape in Brooklyn to determine which developers are most active in the ever-popular borough. The analysis — which used permits filed with the city’s Department of Buildings between July 2011 and July 2014 and zeroed in on new residential projects with 10 units or more — found the top 15 developers included longtime Brooklyn players, as well as developers who traditionally focus on Manhattan. Together, those 15 developers had 35 projects totaling 10.2 million square feet. 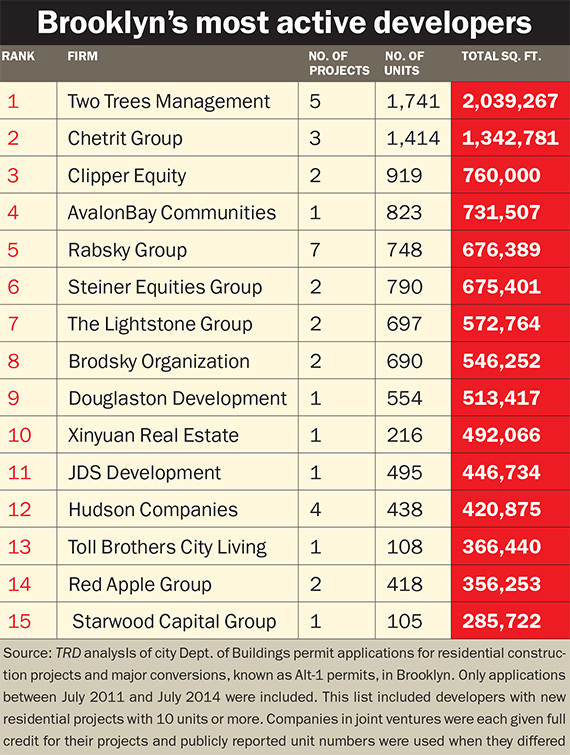 The most active developer in the borough, according to TRD’s ranking, is Two Trees Management, which is spearheading the massive redevelopment of the Domino Sugar factory in Williamsburg. Led by father-and-son duo David and Jed Walentas, Two Trees currently has five buildings and 1,741 total units under development, according to TRD’s research. The rest of the top five included, in order, the Chetrit Group, Clipper Equity, AvalonBay Communities, and the Rabsky Group. If the group seems diverse, it’s because Brooklyn has captured the attention of developers and lenders looking to capitalize on its popularity. “There are very different names in Brooklyn that you see today … that have never come to Brooklyn before,” said David Bistricer of Clipper Equity, which has two projects totaling 919 units. The firm is partnering with the Chetrit Group on a 199-unit rental at 123 Parkside Avenue, the former Caledonian Hospital on the border of Prospect Park South and Flatbush. “It wasn’t like that five years ago,” Bistricer said. Clipper and Chetrit are also developing a two-tower luxury rental project at 77 Commercial, with 720 units on the Greenpoint waterfront. In June, the developers requested demolition permits for the site, which will include one 30-story and one 40-story tower. The biggest Brooklyn project out there is, not surprisingly, the redevelopment of the Domino Sugar refinery into 2,300 rental apartments. Of those 2,300 units, permits have been filed for 1,071 units at the project. Those units are at 2 Grand, a 35-story tower with 658 units; 320 Kent, a 320-unit waterfront tower; and 262 Kent, a mixed-use tower with 93 units. In addition to the Domino project, the firm has also filed permits for 9 Front Street, a 289-unit rental in Dumbo, and 286 Ashland Place, a 381-unit tower in Downtown Brooklyn. Meanwhile, the Virginia-based AvalonBay, a publicly traded real estate investment trust that ranked No. 4, is developing 100 Willoughby, an 823-unit rental in Downtown Brooklyn. In addition, the under-the-radar Rabsky Group, No. 5, has seven projects with nearly 750 units, while Steiner Equities Group, No. 6, is developing the Hub, a 750-unit rental at 333 Schermerhorn Street in Downtown Brooklyn. The firm also plans to rehab a 40-unit rental at 815 Broadway in Bushwick, which is awaiting city approval. But the borough’s high land prices are giving some developers pause. “I’m not sure that we would buy much at the current pricing,” said Doug Steiner, the head of Steiner Equities Group and Steiner NYC. Steiner said he’d prefer to wait for the “inevitable decline in the market” before adding to his pipeline. Meanwhile, the Lightstone Group ranked No. 7 with a two-building complex totaling 697 rental units in Gowanus. The Brodsky Organization ranked No. 8, and longtime Brooklyn developer Jeff Levine’s Douglaston Development, which developed the Edge condo buildings in Williamsburg, ranked No. 9. Levine is currently building a third Edge tower, a 40-story building with 554 rentals. China’s Xinyuan Real Estate rounded out the Top 10. It is a prime example of a development company looking to capitalize on Brooklyn’s (relatively) newfound real estate potential. The firm went directly to Williamsburg for its first U.S. development, landing $165 million in financing in June for a 216-unit condo development at 421 Kent Avenue. In addition, Michael Stern’s high-profile JDS Development clocked in at No. 11 with a 495-unit, 70-story tower at 340-366 Flatbush Avenue Extension, a joint venture with the Chetrit Group. It’s unclear if the project will be a condo or rental. Price increases in the rental and condo markets are, not surprisingly, luring developers to Brooklyn, according to Dave Behin, president of investment sales at real estate marketing group MNS, who helped developers buy $44 million in real estate last year. SJP Properties, a major developer in New Jersey, is a case in point. It’s looking for its first residential project in Brooklyn, Enrique Alonso, SJP’s senior vice president, told TRD. Between Manhattan’s astronomical land prices and Brooklyn’s popularity, he said, “We see a big upside.” He said SJP is looking to do rentals and is hunting for buildings over 100,000 square feet. Several other firms are further along at making a mark in the borough. Brodsky, which has two projects totaling 690 units, and Naftali have both entered the Brooklyn market in the past two years, along with national players like Toll and Avalon Bay. And, of course, it’s not just Brooklyn’s hip factor that’s luring them. The numbers are adding up. Behin said prime neighborhoods like North Williamsburg command rents of $50 per square foot, up from $30 or $35 per square foot in 2009 and 2010. Condo values have grown from $600 or $650 per square foot to $1,200 to $1,500 per square foot in the same time period. “That’s attracted a tremendous amount of development,” Behin said. Naftali, whose firm did not make the list but has been actively developing, said his investment in the borough is reaping rewards. He said he’s getting $62 per square foot in rent at two of his developments — the 104-unit rental at 267 6th Street called the Landmark Park Slope and 316 Bergen Street in Boerum Hill. The Bergen, which launched in June, was 80 percent leased by the middle of last month, Naftali said. “That’s very good [market] feedback,” he said. But, he said, the same rental projects wouldn’t pencil out these days. In prime neighborhoods, land that sold for $100 per buildable square foot in 2009 and 2010 is now trading for $400 per square foot, according to Behin. That heightened competition is another factor driving developers toward condos. “There’s so much rental in the pipeline. You’re competing for the same tenant,” according to Andy Gerringer, the managing director of new business development at the Marketing Directors. Roger Fortune, a vice president at the Stahl Organization, said developers looking to build taller, bigger and more expensive projects are virtually forced to build condos to make the financing work. “The newest projects … will have at least some condo component,” said Fortune, whose firm developed 388 Bridge, a 590-foot high-rise with 234 rentals and 104 condos. After launching sales in January, 75 percent of units were accounted for by last month. Still, against the backdrop of rising land prices and successful projects, lenders are chasing deals with increasing frequency, sources said. “Two, three years ago it was very difficult to finance a condo project [in Brooklyn] and I think that’s one reason you have seen a lot of rental product in the pipeline,” Fortune said. At the time, lenders weren’t yet convinced that buyers had an appetite for Brooklyn. And post-2009, condos were deemed too risky, since developers essentially only had one chance to sell the units and pay back the interest on their loans, whereas rentals generate annual income. Today, the reverse is true. For example, the private equity firm the Carlyle Group is currently partnering with Flank Development to develop a 140-unit project at 140 Schermerhorn Avenue in Boerum Hill, a building that will be part condo and part hotel. In June, Xinyuan Real Estate announced a $165 million loan from Fortress Investment Group at the condo 421 Kent. And last month, Los Angeles-based Est4te Four obtained a $50 million loan package for a condo project at 160 Imlay Street in Red Hook. Developers are also pushing further into Brooklyn as competition heats up in prime neighborhoods like Brooklyn Heights and Williamsburg, where land prices have increased the most. The Lightstone Group’s Gowanus project, for example, includes 363 Bond Street, which will have 268 units, and 365 Bond, which will have 429 units. Slate, a longtime player in Williamsburg, has increasingly looked at neighborhoods like Bushwick, Clinton Hill and Downtown Brooklyn for development opportunities, said co-founder David Schwartz, who wouldn’t look at those neighborhoods five years ago. Schwartz said an influx of retail, infrastructure and entertainment — notably the Barclay’s Center — has changed how developers (and potential tenants) perceive Downtown Brooklyn. Stahl’s Fortune pointed out that Downtown Brooklyn has the greatest concentration of available air rights in the city, other than Manhattan’s West Side. “Manhattan only has so many development sites for high-rise residential and if you’re seeking to do a 50-story building, there’s only a handful of places to do it,” he said.